Hi and Welcome to my blog!! 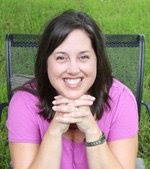 I am so excited to be a participant in this month's Papertrey "Blog Hop." A dear friend of mine recently purchased a new car and, once I heard the news, I knew exactly what stamp set I wanted to use to help her celebrate. 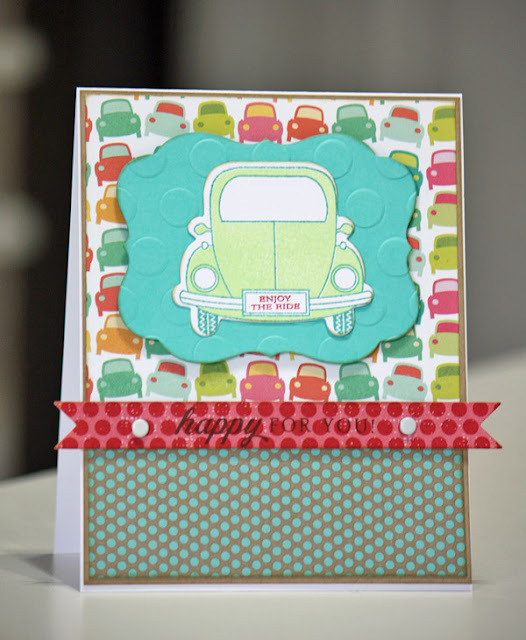 I went to my Papertrey stamp collection and got to work using the "Enjoy the Ride" stamp set. I've loved this set since the moment I saw it released, but have actually waited quite a while before using it. Why? I am not sure, because it is so much fun! It was also a perfect match for this month's theme which is to use a stamp set that has seen little or no ink. I began with Papertrey's white and kraft cardstock, along with a Spellbinders die cut using Hawaiin Shores cardstock which I embossed with a QuicKutz embossing folder. I also found this really cute patterned paper in my stash, and sorry....I don't know who the manufacturer is....it is something I found on clearance at my local scrapbook store. I paired the patterned paper with Papertrey's Distressed Dots paper and Dotty Biscotti paper. 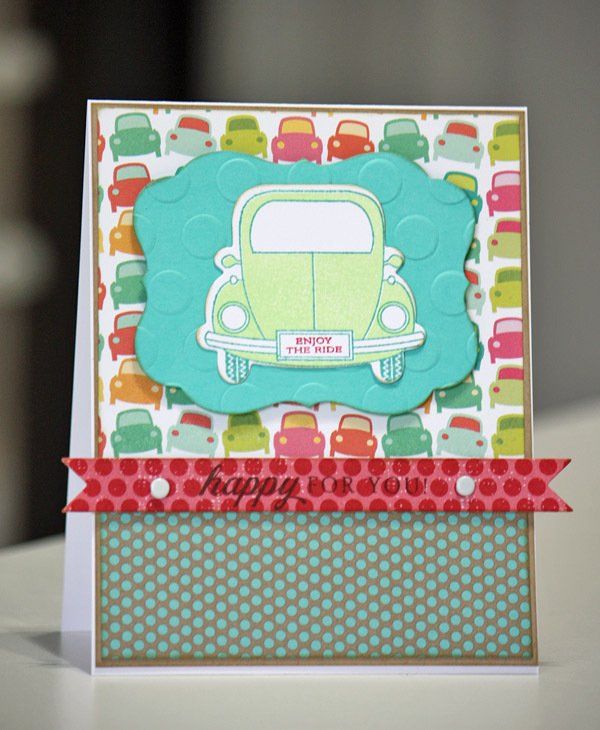 Other dies I used include the Enjoy the Ride car die, along with the double-ended banner die which I love!! Inks I used include Papertrey's Dark Chocolate and Pure Poppy. Other ink colors include Stampin Up's Gable Green and a Marvy turquoise. I also paired this card with a scented air freshener for her car from Bath & Body Works. I hope you enjoyed your visit and be sure to come back soon!! Fun little card! It is a cute set. Cute! I love this set. Oh my goodness! This is adorable. Love everything you've done with it. Such a cute, fun card! How FUN, love this colorful card! That paper is perfect for that car! This is so adorable! I love the patterned paper with the cards, and the embossed spellbinders die looks great! So cute! I love the Enjoy the Ride car with that patterned paper. So cute! Thanks for sharing! Oh my goodness, this is such a happy little card! What a perfect patterned paper to use, and the polka dots on the bottom are super cute! Look at how cute this is!!! Love that you found that patterned paper in your stash. It was waiting for just this occasion because it's absolutely perfect! Lovely, fun card. What a happy coincidence to find this perfect patterned paper in your stash! Cute card. That patterned paper works so perfectly with the Enjoy The Ride set! Great card! Adorably Cute Card! Love the PP and all the fun colors on it. And gifting it with a car freshener is perfect!